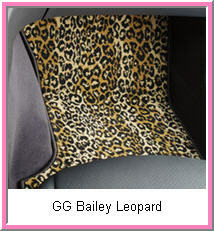 Luxurious Pink Car Floor Mats from GG Bailey! GG Bailey makes pink car floor mats , but the big question is who buys pink car floor mats? The younger fashion buyer does, that’s who! You say you don’t like pink! 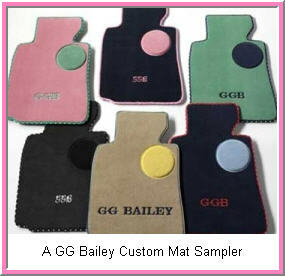 Well how about GG Bailey’s Car Couture line of super luxurious car mats? They come in Oriental and Jungle Animal motifs, and are made of extra plush 72 oz. stain resistant woven polypropylene carpeting from Stark Carpet. And if you're a tad bit more conservative or maybe a little Scottish, GG Bailey also makes two-tone beige and two-tone grey Subtle Style car floor mats from high quality nylon fiber carpeting that meets OEM specifications. But whether you want pink or jungle or polypropylene or purple polka dot edging, navigate over to the GG Bailey website and use their “Design Your Car Mat” software to totally customize your car floor mat experience. You’ll get what you ask for since GG Bailey is the only manufacturer of custom car floor mats to sell direct to the public. And to make you feel better about buying pink car floor mats, GG Bailey donates a portion(10%) of the purchase price of each pink mat(pink carpet + pink serging + pink heelpad + pink embroidery) sold to the Breast Cancer Research Foundation. That's a whole lotta pink in your car mat and great big gob of green for the Breast Cancer Research Foundation! And make sure you keep these beautiful pink (or whatever color) mats as clean and dry as possible by using universal absorbent car mat protectors. Makes cleanup a breeze too! GG Bailey does a lot of things that are, well, let's say, different. 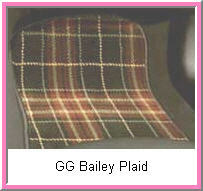 Besides selling custom designed car floor mats direct to the public and being really into Pink, GG Bailey also lets you take a custom pattern for your classic car or for most other vehicles they don't have a pre-existing pattern for. They send you a custom pattern kit that guides you through the process of making your own pattern for your floor mats, trunk mats or cargo mats. And talk about different. GG Bailey also makes pet floor mats and floor mats for your home in the same basic Car Couture patterns you can customize for your car. So now you can artistically co-ordinate your car, truck, dog, cat, home and anyplace or anything that needs a mat with a GGB floor mat! I'm thinking pink car floor mats in my black SUV, a pink pet floor mat for my black Labrador and a pink kitchen floor mat to match up with the black enamel appliances! No, wait, that was just a dream! But you can match up some of the Car Couture Animal and Plaid designs with the pet and home floor mats. Oh, well, I still like the dream of all those pink mats color co-ordinating the SUV, the Dog and the Kitchen! 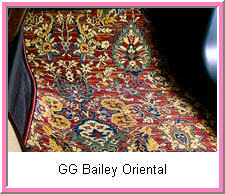 If you like the pink dream or want to experience your very own custom car mat dream, a trip to the GG Bailey website is for you.